JAY Z and Chris Martin took the Tube in London on Saturday (12.10.13). The A-list friends shocked passengers after they hopped on to the underground train to travel from Waterloo Station to the 43-year-old rapper's sold out gig in the O2 arena as part of his 'Magna Carta Holy Grail' tour. Several commuters tweeted about seeing the group on the public transport system. One passenger wrote: "Coming off the tube and I see Jay Z casually walking up the next escalator next to me... EVERYONE GOES NUTS!! WTF??!" 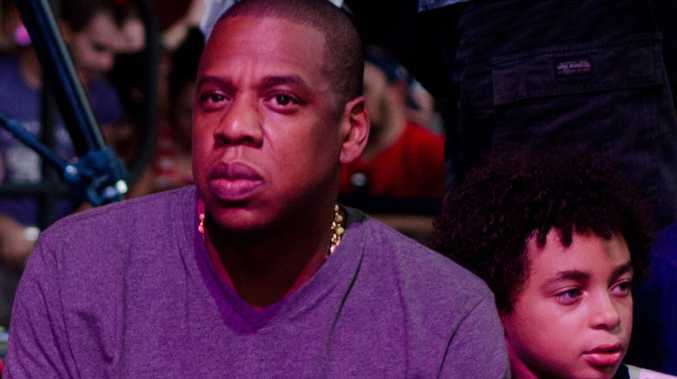 Another posted: "So jay Z gets on a tube to his own concert LOOOL about 500 ppl just ran after him (sic)"
They were also joined by music producer Timbaland, manager Ty Ty and Atlanta Records executive Michael Kyser, according to the MailOnline website. Coldplay rocker Chris, 36, and Timbaland, 41, joined Jay Z on stage during his concert to perform his hit 'Heart of the City (Ain't No Love)'. Rihanna, Muse frontman Matt Bellamy and Florence Welsh have all been spotted on the Tube in the past, and Jay Z previously took the subway to his gig at the Barclays Center in New York City last December. Coldplay will have to pay to play at Super Bowl?